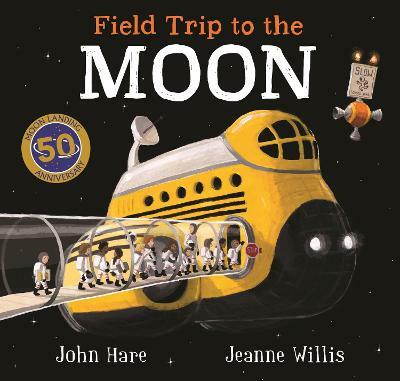 With stunning original artwork by John Hare and charming text by bestselling and award-winning author Jeanne Willis, Field Trip to the Moon is a wonderfully witty story about exploration, creativity and making friends in the most unlikely places. 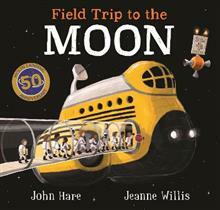 It's not every day you find yourself on a field trip to the moon, let alone stranded in outer space! But for one student that's exactly what happens when her curiosity separates her from the rest of her class. Why wouldn't you take the opportunity to get your crayons out, look back and draw planet Earth? Alone on the moon, she sits down to draw. But could there be an even bigger surprise when she realises she's not alone? What would someone that lived on the moon even look like? Be prepared to find out what happens when you reach out to those that are different from us and greet them with an open pack of crayons! John Hare spent his youth in Kansas drawing comic strips and writing stories about a crime-fighting crocodile. He earned an associate's degree in graphic design and became an art director for a sportswear company, later moving to Kansas City to work as a freelance graphic designer. Jeanne Willis was born in St Albans, Herts, in 1959. Jeanne is an internationally renowned, full-time writer and has published over a hundred books - ranging from picture books including The Bog Baby and Who's in the Loo?, to YA, poetry and fiction. She has won several awards, including the Children's Book Award, the Silver Smarties Prize and has also been shortlisted for the Whitbread Award.